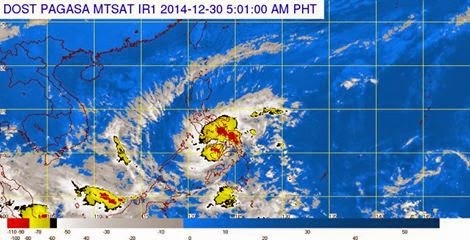 December 30, 2014: Seniang made landfall in Cebu early morning of Tuesday that brought huge damages in southern part of Cebu. • Estimated rainfall amount is from 7.5 – 15 mm per hour (moderate - heavy) within the 300 km diameter of the Tropical Storm. • Residents in low lying and mountainous areas of the provinces with PSWS#2 and PSWS#1 are alerted against possible flashfloods and landslides. • Ocean waves may reach up to 5 meters. over the northern and eastern seaboards of Mindanao. • The public and the disaster risk reduction and management council concerned are advised to take appropriate actions and watch for the next bulletin to be issued at 11AM today. Strength: Forecast to move West Northwest at 11 kph. • 24 hour (Tomorrow morning): 235 km West Northwest of Dumaguete City. • 48 hour (Thursday morning): 115 km South Southwest of Puerto Princesa City. unroofed and old galvanized iron roofs may roll off. These areas will have stormy weather with heavy to intense rains. Visayas: Leyte, Southern Leyte, Camotes Island, Iloilo, Antique, Capiz and Aklan. Occidental, Misamis Oriental and Zamboanga del Norte. These areas will have moderate to heavy rains with occasional gusty winds. Residents in low lying and mountainous areas are alerted against possible flashfloods and landslides. bulletin to be issued at 5 AM today.